Enrage: 7 minutes and 20 seconds. Loot: 1x Kell Dragon Relic, 1 random Shadowed item (L75 stuff without set bonus), 8 Elite Commendations, 6 Ultimate Commendations, 1 Mass Manipulation Generator, 2 Exotic Element Equalizer on 8m. This fight is tightly tuned for nightmare and is a step up in difficulty from The Withering Horror. Phase 3 especially put a lot of stress on healers. Try aim for 2 Lighting Fields only to help with enrage. Lighting Field now slows you and Heirad’s Surging Chain reflects damage. Heirad’s attack cycle abit faster and as a result you have a shorter time between Lighting Fields. 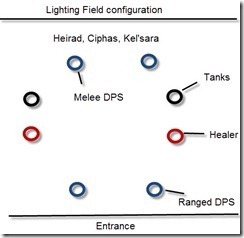 This means you will need a much higher DPS to ensure that you only get two Lighting Field in this phase. . Having three Lighting Fields may cause you trouble with the enrage. 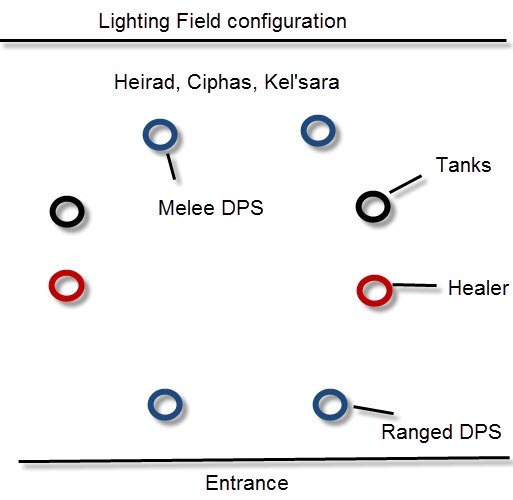 Heirad’s Lighting Field attack will also slow player, making getting to your position much more difficult. Our typical Lighting Field configuration is this on 8m. This allow healers to top off anyone that is low on HP before the Lighting Field hits. Ranged DPS and healers stack in the middle after Lighting Field hits for AoE heals (be sure to not stack directly on the boss since he has a knockback when he casts Surging Chain that can interrupt your heals/DPS). The explosion at end of Lighting Field hits for ~16k on unprotected players. 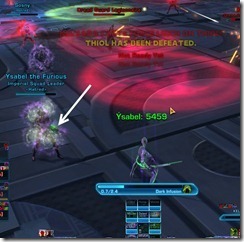 Assassins/Shadows can use Force Shroud to block the damage from Lighting Field. Sorcerer/sage Force Barrier also works in blocking all the damage from this attack. Also, it should be common knowledge but control your collateral damage to Ciphas and Kel’sara this phase as otherwise they will buff Heirad and increase his damage. Lastly, the Surging Chain attack by Heirad will reflect any damage done to him so make sure you jump on Ciphas right away to break the shield. The big change to this phase is that Ciphas’s Doom is now six stacks. This means that you want to try avoid accidently eating a green circle when you don’t have Doom on you as that can get the “doomed” person killed. The player with Doom will probably need to consume all the green circles and then wait for new circles to pop up to remove all six stacks. Sorcerers/Sages with their Force Barrier ability can avoid the damage from Doom, allowing them to not bother with Doom and giving the raid a few extra green circles. Snipers/Gunslingers can also time their roll ability with end of the Doom to not take any damage once the Doom stacks expires. Ciphas tend to strangle players that are furthest from him so if you are low on HP (<60%) try stay near Ciphas so you don’t get strangled and killed. When Ciphas dies, all Doom stacks are removed so you do not need to worry about dying to Doom afterwards. Force Leach hurts if tanks receives an accidental heal. Make sure tanks are shielded if you have sorc/sage healers to prevent any collateral damage. Players will now drop red circles (Expiatory Motes) on the ground in a similar manner to phase 2. These circles cannot be removed and put a long lasting DoT on anyone that touched them that ticks for ~7k damage every 3 seconds (lasts for 15 seconds or more). While most players are able to move away from these circles, you will have to watch for knockback from Kel’sara and her adds. You want to place these red circles on the outer edges of the room to prevent players from accidently stepping or getting knocked into them. You can remove the DoT you get from stepping into the red circles by running into a green circle from phase 2. Like in phase 2, watch for swirling orbs around your character. If you see swirling orbs, start running so you don’t have a red circle spawn under your feet. 3. The three Dread Guard Legionnaires that Kel’sara summons all have ~50K HP each and hit a bit harder. They should be tanked if possible to avoid having them running rampant and killing the DPS/healers. If you are not familiar with the hardmode mechanics, here is a quick brush up for you. For a more detailed guide, please consult this guide. Heirad’s Lighting Field attack hurt less if everyone is spread out. Ciphas dooms random players. Doom stacks can be removed by running into green circles dropped by other players. Ciphas will also leap and strangle random players. Tanks/melee DPS will need to interrupt Ciphas ASAP. Kel’sara casts Force Leach on main tank, tank swap and stop healing the tank with the debuff as any heal will translate to damage. 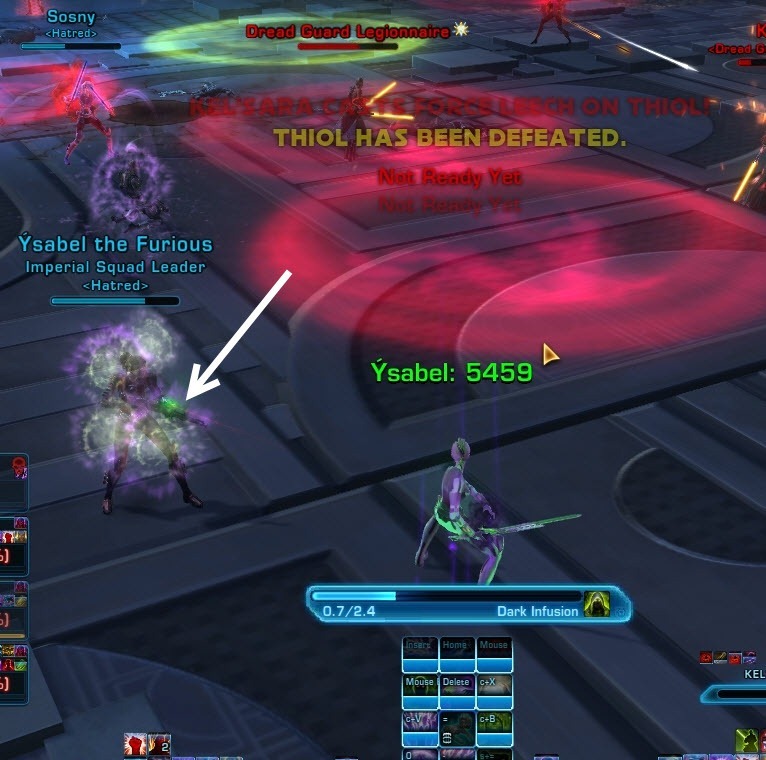 Kel’sara will also put a Death Mark on a random raid member and chase them. She will likely one shot anyone if they don’t run away. Lastly, Kel’sara casts a DoT called Withering Terror on a random raid member that hurt quite a bit, make sure they get healed. 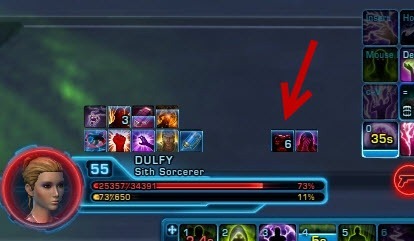 Anyone know if Force Barrier works against one shots like Doom or Color Deletion Protocol? I know it works against Doom in Hardmode but it might not work in Nightmare. For anyone else curious, our healer tried it. It won’t clear the Doom debuff, but if you’re in it when the debuff runs out, you’re safe. did you try in HM or nightmare mode? It works on Nightmare, just tried it. Ya they buffed the HP on live. Our best attempt is 40% on Kel’sara with possible enrage at 15% if we didn’t die off. It sounds possible in theory but seems really overtuned atm. Fights are subjected to change on live server, that is something you should expect. If the fight gets changed, the guide gets updated. Those of us who did it on the PTS were thrown off too by the sudden increased in diffculty so you are not alone in that. The enrage here is not normal. It is due to them buffing the HP too much. To my knowledge no one has beat this encounter yet due to enrage. yes i know, worlds best try was 28% enrage as far as i know. but no one from the “yellow” admins wrote anything about that problem. but nobody knows some extra mechanics in this encounter which wasnt on the pts? I heard some EU guild downed it,they had their tanks attack heirad for the first phase and had them use aoe moves to maintain aggro on the two others.Smart thinking and insane dps.Hopefully this helps other guilds get through until patch,however this did take them more than 100 tries.Cheers Europeans,being more efficient than us Americans again QQ. Sentinels/marauders can also use their guarded by the force to not get killed by doom. One of my guild mates recently discovered that Mercs/Commando chaff flare/diversion can absorb Doom if used at the right time and if you have the two talent points in “decoy” (arsenal/gunnery tree). Damage reductions seems to be quite slight – but noticable. Just on the forgiving side on red puddles, for instance – quick grabbing of green puddles and they’re now survivable. I have a question about healing mechanics in phase 3. As a commando healer, can I put my Trauma Probe on the tank or will it instantly kill him if the other tank is late with their taunt? As it seems commando healing is really challenging here as I cannot use my Hammer Shot either since it cannot be interrupted by jumping or moving. Any tips from other commando healers? Been trying this one lately. First two are easy, but red puddles just destroy us. Looked from your video like there weren’t very many puddles and puddles didn’t appear under tanks, allowing them to hold still and letting melee maximize DPS. Also noticed the healer who was making the video stood where the adds appear and not one red puddle appeared under her. Is there a way to encourage puddles to appear in a certain way? We tend to stand on the outer edges of the room so if we do get puddles, we place them away from rest of raid. As for me not getting the puddle, that is just RNG I think.